The Grade II listed Grand Station is steeped in history and a breathtaking setting for your wedding celebration. The timeless elegance of the venue will be felt throughout your entire wedding experience and begins when you first step into The Old Ticketing Hall. Draped with an ornate chandelier, the architectural features of beautifully restored interior are a perfect backdrop to a magical day. The iconic building is situated in the heart of Wolverhampton City Centre and has excellent links to the train station and local motorways as well as ample complimentary parking. With our Grand Hall accommodating between 200 and 500 guests, and our Brunel Suite seating upto 130 guests, we can tailor our venue to suite your celebration requirements. Our dedicated wedding team are on hand to assist you though every aspect of your special event. We are accustomed to the level of detail and work that goes into planning and providing and as such; we're able to provide you with and unforgettable experience that is brilliantly executed from start to finish. To get in touch to discuss your wedding plans or arrange to visit us, click here. Make an entrance as a married couple in the beautiful Old Ticketing Hall with its Italian renaissance ceilings and classic sash windows. Have your wedding photographer take stunning shots of your wedding party beneath the magnificent chandelier. The Old Ticketing Hall is also a Civil Ceremony licensed room with 150 guest capacity. Adjoining the hall is a cosy and atmospheric bar where you can relax and enjoy the company of your guests over drinks. This elegant area can be tailored to your personal preferences and the option of a red-carpet entrance. Our Grand Hall can accommodate between 150 and 700 guests. 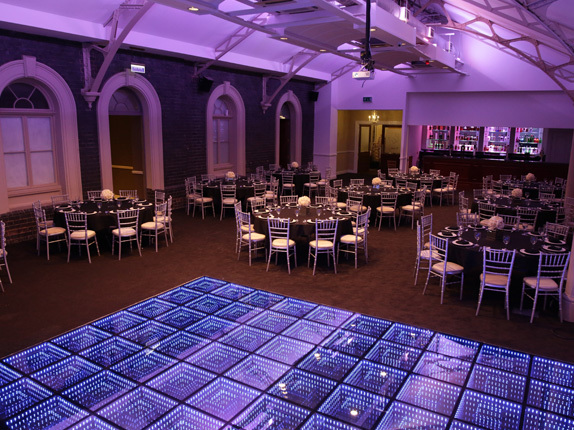 Originally the old station platform, our Grand Hall has been transformed into a versatile event space which can be made to suit. Our Brunel Suite can accommodate up to 150 guests. Allow your guests to be fully involved in the celebrations, with beautiful original features, our Brunel Suite is the perfect space for a smaller amount of guests. However you wish to celebrate your marriage, with traditional or modern elements or your own tailored and personal blend, we can make it happen at Grand Station. Our experienced team of wedding specialists can help you select options to ensure your celebration is stress-free, brilliantly executed from start to finish and filled with your own personal touches. Would you like one of our events team to call you? Thank you for your enquiry. A member from our dedicated team will be in touch with you shortly.